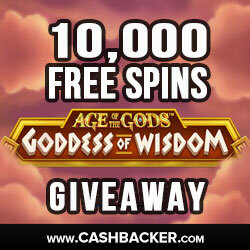 10,000 free spins up for grabs in new Age of the Gods game launch! The Age of the Gods series has just got bigger, with Goddess of Wisdom becoming the latest slot game added to it, and to celebrate its launch Bgo Vegas are giving you the chance to earn multiple free spins. In fact, a total share of 10,000 free spins (yes 10k!) are on offer to 220 lucky players, but be quick as this impressive promotion ends on August 10th 2016 at 23:59 BST. All you have to do to qualify is opt-in and wager £25 across any of the Age of the Gods games, which will earn you one ticket and therefore one entry. You are allowed to collect as many as you want to give yourself a better chance of winning, so stake away! Make sure to log in to your account to see how many tickets you’ve earned too. Not long until promotion expires! Once the promotion ends on August 10th, the 220 fortunate winners will get their share of the 10,000 free spins the following day by 19:00 BST. By coming first, you’ll earn 200 free spins, while you can win at least 100 if you finish anywhere in the top five. If you come between 200th- 220th, you’ll still get 10, so take advantage of this promotion while you can! So, what are you waiting for new and existing bgo customers? Opt-in now, stake £25 on any Age of the Gods game (including the recently launched Goddess of Wisdom) and maybe you’ll be one of the lucky 220 winners to win multiple free spins on August 11th?